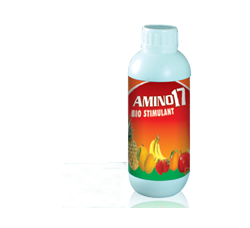 Amino Acids are required by plant for synthesis of most important enzymes and hormones which is needed for completing metabolic activities. Most of protein syntheses are due to Amino Acids that are known as building blocks of any life (plant or animal). As such all Amino Acids are essential but many play important roll in life of plant. It promotes hormonal activity and induces their synthesis resulting into flowering and fruit setting. It also reduces the flower and fruit drop caused by hormonal imbalance. It enhances nutritional uptake and their utilization which improves the colour, size, luster and taste of fruits. It also improves keeping quality. It is an ideal product to resist from adverse conditions. The foliar application enables the plants to receive direct benefits from naturally balanced nutrients/ growth stimulating substances when they are needed by the plants especially at the time of stage differentiation.